So I bet you're dying to read about Glogirly's visit to California. Well she's not quite there yet...lots to do to get ready. It's a trip that was 45 years in the making. It's going to take a little bit of preparation. Three weeks. That's all the time that Glogirly had to prepare for her trip to California. Glogirly is an over-packer by nature. She blames it on shoes and being a girl. This was a particularly tough trip to plan for. What do you wear when you're going to meet your birth family face-to-face for the first time? Wardrobe was not her only worry. She knew that Dorothy and Jeanette would be interested in seeing photos of her own family. 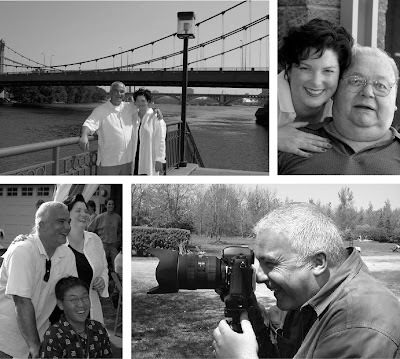 How do you possibly narrow down a life into a few snapshots? Choosing just the right pictures was a challenge. Fortunately, Glogirly's dad took lots of photos when she was little and Gloman was born with a camera in one hand. She had a lot to choose from. She put about 50 photos together into a slide show on her laptop. She even added music. Yes, she was an over-achiever. 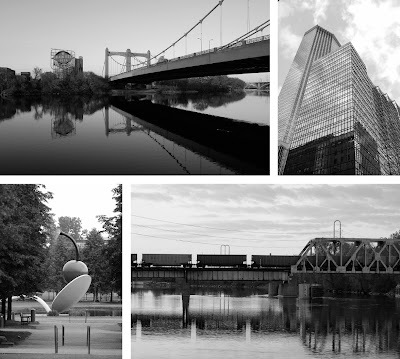 Glogirly included photos of downtown Minneapolis, where she and Gloman lived. TOP LEFT: That's the Hennepin Avenue Bridge over the Mississippi River. They were married right there on the banks of the river and now live just a block away. TOP RIGHT: Part of the downtown skyline. LOWER LEFT: Spoon Bridge & Cherry, a Minneapolis landmark sculpture. LOWER RIGHT: The tracks on this railroad bridge over the Mississippi run right behind Glogirly and Gloman's townhouse. They love to sit on their deck and watch them go by. 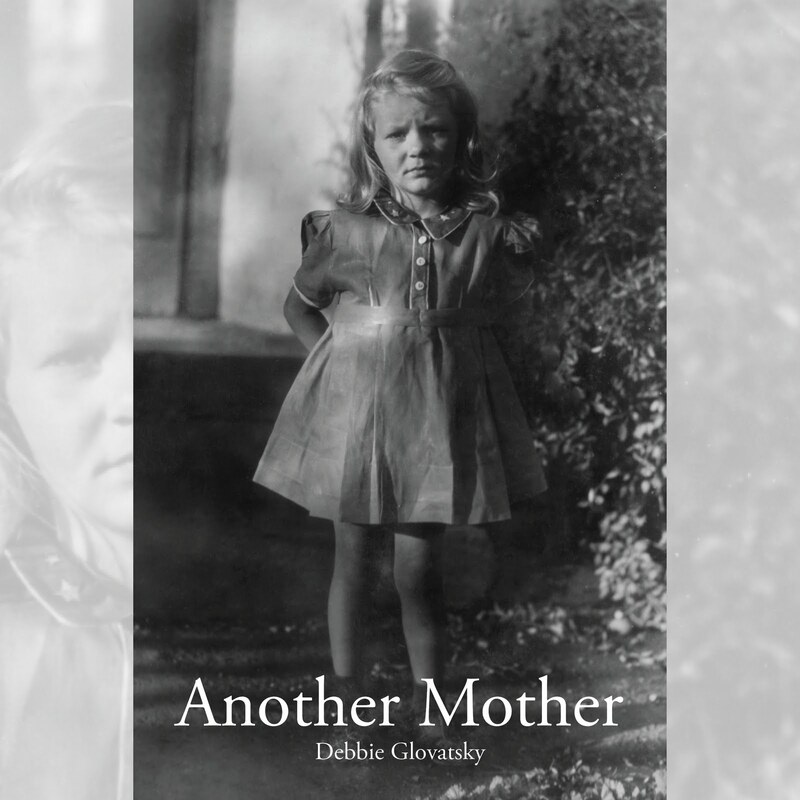 She shared photos of her adoptive mom and dad before Glogirly was born. TOP LEFT: Glogirly's dad. He loved cars. So does Glogirly. TOP RIGHT: Their wedding photo. She was barely 16, he was 21. LOWER LEFT: Glogirly's mom, shortly before they married. LOWER RIGHT: A going away party before they moved from Minnesota to California. They already knew they wanted to adopt. There were photos of her adoptive parents and a Very Young Glogirly. 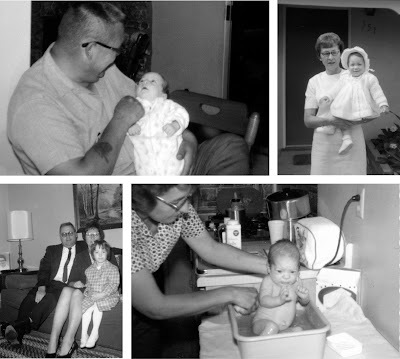 TOP LEFT: Glogirly in her daddy's arms at just a two months old. TOP RIGHT: Glogirly and her mom in front of their pink Santa Maria home. LOWER LEFT: And three makes a family. LOWER RIGHT: One of Glogirly's very first baths. Then came pre-school, grade school and all the way up to high school. 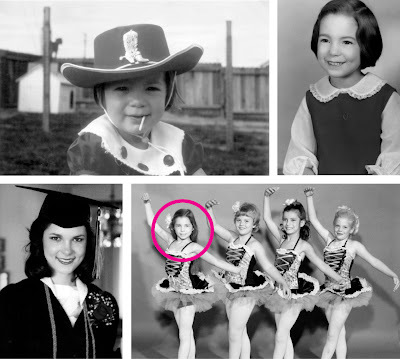 TOP LEFT: Once a cowgirl, always a cowgirl. TOP RIGHT: Glogirly's preschool portrait. LOWER LEFT: High School Graduation. LOWER RIGHT: Glogirly's ballet recital pose. And last, a few snaps from Gloman and Glogirly's wedding day. 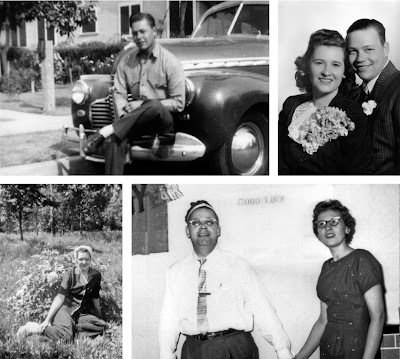 TOP RIGHT: Glogirly with her dad, not long before he passed away. LOWER LEFT: 3 makes a family. Gloman, Glogirly & Gabe, Gloman's adopted son. LOWER RIGHT: If there's not a camera in his hand, it's just not Gloman. Glogirly knew that having some wonderful family images to share would help to tell her own story. She hoped there would be photos of Alice for her to see. Dorothy had mentioned that she would pull out all of her old albums and have her sister, Jeanette, do the same. Glogirly took a chance and packed her scanner with her laptop just in case she had an opportunity to bring some photo scans home with her. Glogirly barely slept the night before her flight. Gloman took time off from work so that he could bring her to the airport and see her off. She was there almost three hours early. She was not going to get stuck in security or miss her flight. Gloman kissed her goodbye, told her he loved her. He reassured her that everything would be fine. Despite how well her phone conversations had gone, she was still very nervous. The confident and assured woman she was felt like a little girl scuffing around in her mother's shoes. The wait inside the airport seemed to last an eternity. But the flight itself was even longer. She brought a movie with to watch on her laptop and pass the time. About 4 hours. When the pilot announced that they would be landing in San Francisco in about 20 minutes, Glogirly's heart was beating fast. She was off the plane in a flash and headed down to baggage claim. She still has a picture in her head of her red duffel bag rounding the turn on the baggage belt. Everything slowed down in her view and seemed to be moving in slow motion. She knew that Dorothy was waiting for her in her car on the other side of the doors. For the first time in her life, she would meet one of her blood relatives. Her birthmother's sister. She knew that this was one of those moments that can change the course of a life. She tried to think about what the first thing was that she should say. That just made her more nervous. So she grabbed her bags and walked through the glass doors. Dorothy was right there. Getting out of her car and running towards Glogirly. Glogirly dropped her bags and they hugged. For a long time they hugged. Dorothy didn't let go of her hands, just stood back and looked at her. She hugged her again. Never before had Glogirly heard those words. You look like... She had grown up fascinated by family resemblances. Sometimes someone would unknowingly say to her, "oh, you look just like your dad." Glogirly and her dad would look at each other and exchange a giggle or a grin. But this time was altogether different. She really did look like someone. I am so happy for you, that you have TWO wonderul families! We want to cry over here! But that's a good thing! How wonderful! Also, just in case you didn't know Glogirly, you've been beautiful your whole life :-). Oh sweet Katie - this story is giving us leaky eyes - happy leaky eyes. We are so happy for Glogirly that she's finally meeting some of her family. TW is over here, crying like a baby. Geez! She says she agrees with Michelle. Let me be the first to tell you Katie: "You look like ME." Oh, that made my eyes leak a little bit. How wonderful! OMG.... I clicked on the first link by total chance.... Now I can't stop reading this..... And there is a line of cats waiting in the kitchen for dinner! I just found this story and right now it's 12:35am; i'm in bed surrounded by cats and crying at your reunion.